In their efforts to emulate the methodology which had proved so successful in the natural sciences, the social sciences – including sociology – have not yet faced the question as to what constitutes understanding in their area with sufficient seriousness. This book asks again: what does understanding denote in an area where man tries to understand man, where self-understanding is involved, where new understanding immediately becomes part of that which is to be understood? What can we know and what is the use and limitation of knowledge in sociology? When are we conscious that we know and understand? 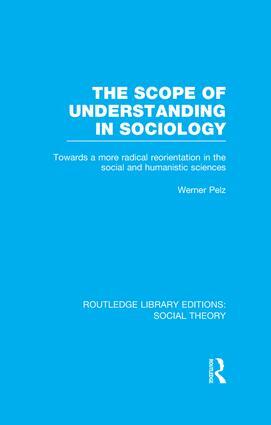 Werner Pelz argues for a thorough reorientation in our approach to sociological thinking, and suggests that scientistic preconceptions have often precluded possibly fruitful approaches to humane understanding. He investigates the relations between various kinds of knowing, and examines the new possibilities of understanding made available, for example, by psychoanalytical and phenomenological insights, as well as by those of poets, artists, mystics. He shows that in the social and humanistic sciences, creative or constitutive contributions illuminate rather than demonstrate, and that, for this reason, sociology has not yet found an appropriate method for conveying them without serious distortions.